Yesterday, I shared out the first steps in taking a poem through its paces, under the banner of “reMEDIAtion” of the Making Learning Connected MOOC. The idea is to see what happens to our work when we move into different platforms, and consider whether the heart of the idea changes or shifts or is transformed. Is “remediation” just another term for “remix”? Maybe. Probably. Possibly. Maybe perusing those words will be my reflection point later on in the Make Cycle. For now, I am using a single poem about liminality as my base point. Yesterday, I talked about moving from a handwritten draft to a typed version, and then using a text layout tool to impact the metaphorical presentation of the writing. That was not very dramatic, in terms of remediation of text. Some, but not much. So, I have turned to audio to see what happens. 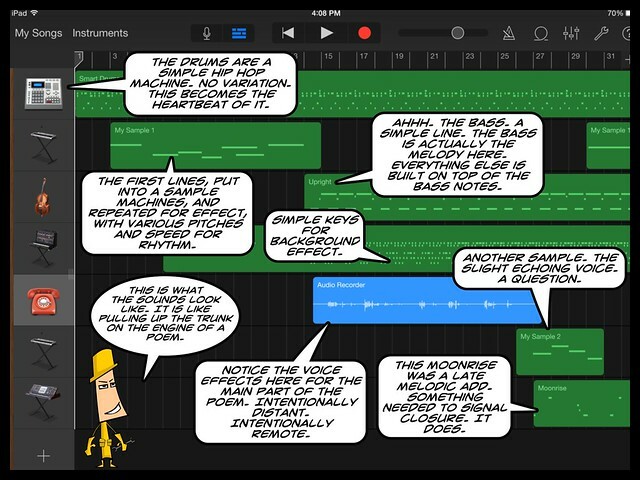 I wanted to move beyond just podcasting — of just reading the words into a microphone — and dove into the Garageband App (one of the best 5 bucks you will ever spend on an app) to see if I could re-compose the poem. The end result, I think, is an aural landscape effect. I hope my use of voice and of music draws the listener in, creating a wider effect of the poem’s meaning. I was intentional with everything. This entry was posted in CLMOOC, comics, Poetry. Bookmark the permalink. Sounds that we are working on similar lines.